Maximizing Progress: Zombie Fungus ~ Mind-Control of Brazilian Ants! "A stalk of the newfound fungus species Ophiocordyceps camponoti-balzani, grows out of a "zombie" ant's head in a Brazilian rain forest. 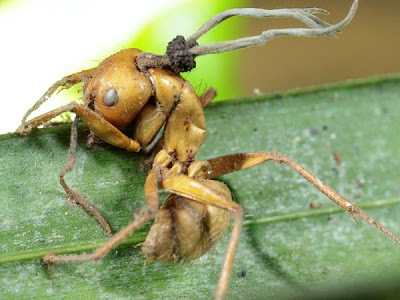 Originally thought to be a single species, called Ophiocordyceps unilateralis, the fungus is actually four distinct species -- all of which can "mind control" ants [...] The fungus species can infect an ant, take over its brain, and then kill the insect once it moves to a location ideal for the fungi to grow and spread their spores." Zombie Ants!? Now I know why we never had an ant problem until the time we left brains out on the counter overnight.